You may have noticed a change here... what we used to call The Catholic Astronomer is now Sacred Space Astronomy. And along with a change in layout and title, we're expanding the way you can support our work. Why the name change? OK, so I admit, I am the guy who came up with the original name. I meant it as a pun, in the sense that "catholic" means "universal" and of course astronomers look at the universe, while our interests on this site cover pretty much the gamut from naked-eye stargazing to theoretical cosmology. 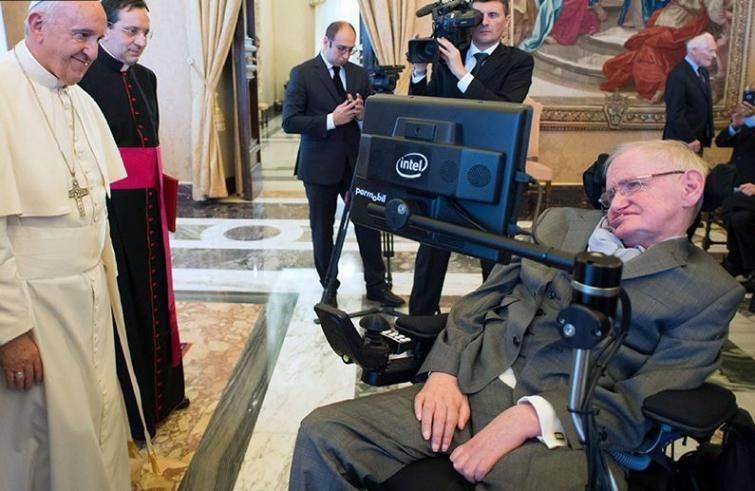 All, of course, under the aegis of the Vatican Observatory Foundation. Well, like most puns, nearly everyone missed it entirely. And since a number of our contributors are not actual Catholics (again, there is a gamut, from practicing Jews to Catholic priests to non-churchgoers) the face value of the title wasn't always appropriate. Meanwhile, for those of you who contribute financially to keep the site (and the Foundation) running, one of the perqs of membership is that we enroll you in a program called Sacred Space, a ministry of the Jesuits in Ireland. So we borrowed that name for our on-line astronomy newsletter. Pleiades Membership: $10 per month, or $100 per year. Pleiades Members receive the annual Sacred Space prayer book and full access to the Sacred Space Astronomy website. Hercules Membership: $50 per month, or $500 per year. Andromeda Membership: $100 per month, or $1000 per year. Please allow up to 48 hours for your access to the Sacred Space Astronomy site to be validated. A password and user ID will be emailed to you once your subscription is validated. But several folks have asked if they could just switch this to an annual gift. We're happy to do that; the fewer times we have to charge your credit card, the less we have to pay in credit card fees (and deal with cards going out of date). So we now offer these same levels at a rate of $100 per year for Pleiades, $500 per year for Hercules, or $1000 per year for Andromeda. Big news: A Challenge! One of our large donors has issued a challenge: they will match whatever new gifts we bring in, up to a total of $50,000. So when you sign up for Sacred Space Astronomy, your donation will be doubled! This column first appeared in The Tablet in April, 2006, and first published here in 2015. It was April Fool’s Day at the Vatican’s telescope in southeastern Arizona, and we’d had three nights of cloudy weather. This night looked promising, however. Bill Romanishin, our colleague at the University of Oklahoma, had given us a list of Kuiper Belt Objects to observe, orbiting out beyond Neptune. Included were some Centaurs, objects that some day might become comets plunging close to the Sun. A coma, a cloud of gas? Odd that this object, thirteen times the Earth’s distance from the Sun, would be warm enough to start vaporizing its ices into a nascent comet tail. So when we finished the standards, we pointed to 60558 and took a “test” image, a 30 second exposure to make sure we were pointed at the stars near the object. We didn’t expect to see the Centaur itself with such a short exposure; at 20th magnitude, it would be a million times fainter than the faintest star visible to the naked eye. But when the image was finally downloaded from the camera chip and displayed on our computer screen, a coma was visible even in the test image! We took a three minute exposure; any longer, and the motion of the Centaur would have blurred its image. It showed an irregular cloud of light actually detached, off to the west of the little dot of light that marked the Centaur itself. Very strange. We ran through the colored filters, and then went on to other objects. But the longer we thought about it, the stranger it seemed. Was it real, or just an internal reflection of some bright star onto our camera chip? Would it be there the next night, after the Centaur had moved to a new field of stars? The next night, our last at the telescope, started out cloudy again. Looking at the satellite weather maps, it looked like we’d have a hole in the clouds just as our object was rising. Fingers crossed... waiting impatiently for the object to rise... the clouds were especially thick in the southeast... the hole was beginning to close in the west... finally... success! The thin clouds cut a magnitude’s worth of light out, but the coma was bright enough that we could see it anyway. There it was again. It was real. We sent Bill the images to analyze, and he found in our data an even larger, but fainter, cloud of light on the other side of the nucleus. Our first bright cloud, we estimated, must be half the size of Jupiter; the bigger cloud is a good fraction of the Sun’s diameter. What causes these comae? We don’t know. We’ve never seen anything like them before. A splitting Centaur? The result of a collision, or a pocket of exotic frozen gases exposed to the sun? Is this a major breakthrough or a mere curiosity? We don’t know; only time and further observations will tell. Usually discoveries are revealed to us gradually, understood only after a lot of “data reduction” has removed the false images of dust on our lenses and compared our faint signals to known standards of truth. But on wonderful rare occasions like this one the discovery blares at us, as obvious as the empty tomb. In 2006, the object known as asteroid 60558 Echeclus was also given a cometary designation as 174P/Echeclus. As of 2015, we still didn't know for sure the origin of this coma. It was tracked for several months and seen to be on an orbit that is slightly different from that of 60558; our best guess is that the source of the coma broke off the main body about a thousand years ago and the two objects have been chasing each other around the solar system since then. More Stats: Since April 2 we've added 60 more people signed up to get notifications of these posts either via Twitter, Facebook, or directly asking for email updates here. And we’ve added two more paid subscribers, now up to 124. Thanks, and welcome! If we could double the size of the readership, would we double the number of supporters? It's probably not that simple... but it would certainly help. Two priest-astronomers, Fr. Matteo Galaverni and Fr. Alessandro Omizzolo, joined me for a tour of Padua; later, Alessandro brought me up to the top of that tower, home to the University of Padua astronomy department. Some Stats: Here’s our latest monthly summary of statistics. As of this writing we have 8,405 people signed up to get notifications of these posts either via Twitter, Facebook, or directly asking for email updates here. As of a bit later in the month, last month, we had 8,336. And back then we had 120 paying members; we’ve added two more, and it nows stands at 122. Thanks, and welcome! If we could double the size of the readership, would we double the number of supporters? It's probably not that simple... but it would certainly help. First published in The Tablet in February, 2008; we ran it here in 2015. I've moved it to March this time around, to fit the Lenten theme at the end. The American Association for the Advancement of Science (AAAS), a prestigious umbrella group of American scientists, convened this past weekend  in Boston. 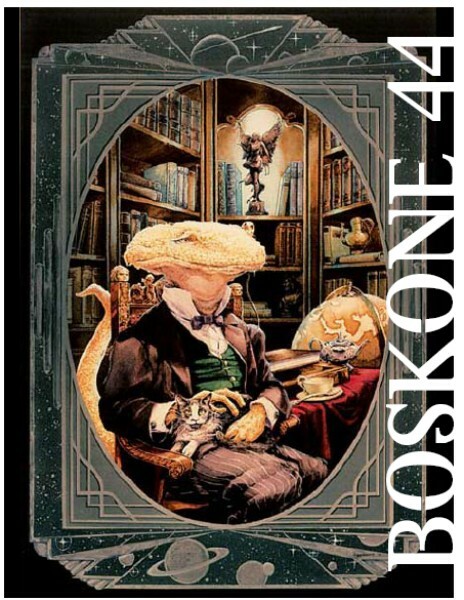 At the same time, in a hotel on the other side of town, a few hundred science fiction fans were gathered to meet their friends and talk about their favorite writers. I sat on science-and-religion panels at both conventions. The program book for one of those conventions; guess which one? The panelists agreed that assuming “if only they knew what I know, they would agree with me,” is a failing strategy. And we also agreed that the militant evangelical atheists, Dawkins and his ilk, are only making the situation worse. But most of the discussion revolved around tactics of framing the issue, as if science could win the argument by choosing the right soundbites. Should we try to recover a sense of hope or a sense of design (if not intelligent) in nature? Does revealing ones’ own religious stance helped or hurt the discussion? Only one person suggested that we scientists might actually learn something from listening as well as talking; and that wise sage (me) didn’t do a particularly good job of getting his point across. By contrast, the discussion at the science fiction convention was both more limited, and more revealing. 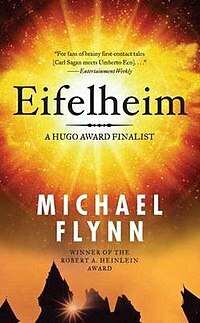 Michael Flynn’s recent novel Eifelheim explored what might have happened if the first contact between humans and aliens had actually occurred during the high middle ages. In the process of writing it, he wound up researching the actual relationships between science and religion during that time. At the SF convention, he was joined John Farrell (author of a new book about Fr. George Lemaitre, the inventor of the Big Bang theory) and me on a panel about the rise of science in the middle ages. To the general public, the history of the period from Rome to the Renaissance is as poorly known as the theory of evolution. But fantasy fans know plenty of the details, albeit in a muddled and unrealistic melange – “the middle ages the way they should have been,” to quote the motto of the medieval recreation society that quite candidly calls itself the Society for Creative Anachronism. Thus we had an audience already primed and eager to hear speculations based on real history. Could the Islamic world have had a Thomas Aquinas? What if the plague hadn’t delayed the scientific revolution, budding at the time of Oresme and Buriden, by 300 years? The AAAS audience was undoubtedly more high-powered, and that panel more professional in their presentations. The SF panelists, by contrast, tended to ramble off topic; writers are not always the best public speakers. But on the whole, I found the science fiction convention to be a far more fulfilling experience: the participants more enthusiastic, the audience more engaged. By contrast, the AAAS panel and audience were afraid to admit that, fundamentally, we haven’t a clue about how to communicate science to religious America. We were afraid to confess our ignorance. It’s not only more fruitful to recognize our shortcomings; it is also more fun. There’s a great relief in not pretending to be perfect. Accepting that one is a sinner can actually make Lent, paradoxically enough, the most joyful of seasons. First published in The Tablet in February, 2007; we first ran it here in 2016. I've moved it to March, this year, to fit the Lenten season. With my colleague Dan Britt from the University of Central Florida, for several years I’ve been measuring the densities and porosities of meteorites. The densities of different meteorite classes can be compared with their parent asteroids, to see how loosely packed they are; and the porosity of these rocks is an indication of how thoroughly their fabric has been cracked by the shock of the impacts that shattered those parent bodies. We started with the collection I curate at the Vatican; but there are many meteorite types that are underrepresented there. When I came to New York [in 2007] for a year’s sabbatical at Fordham University, I had hoped to extend our data by looking at the nearby American Museum of Natural History’s extensive collection. 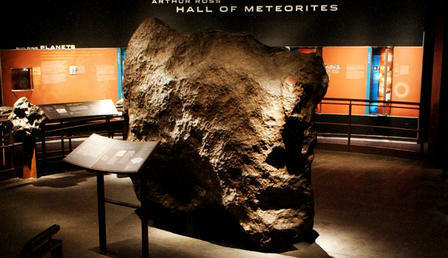 The American Museum of Natural History has a fabulous collection of meteorites. For a year while I was in New York City, I got to walk past these... on the way to the lab, behind closed doors, with many more, and much smaller, samples! But things got off to a slow start. It took time to settle into Fordham; and Dan, who’d been storing our equipment in Florida, had new responsibilities too. Finally, in December, the equipment was shipped to New York. It arrived just in time for Christmas… and the holidays. Then I spent another week at my Jesuit province congregation. Finally, in mid-January, Dan himself came up to New York bringing the few last bits needed to get to work. The key instrument we use is an Ultrachrome Pycnometer. It measures meteorite volumes on the same principle that had sent Archimedes running down the streets of Syracuse, naked from his bath, shouting “Eureka.” He’d realized that you could measure volumes by dipping a body into a pool of water and seeing how much water is spilled out of the pool. We don’t want to dip our fragile meteorites into water, however. We use inert helium gas. Two chambers are pressurized with helium, one at a pressure higher than the other; we compare pressures beforehand, open a valve between them, and measure the final pressure. Then the meteorite is placed in the higher pressure chamber, and process repeated. The bigger the volume of the meteorite, the less room there is for the pressurized gas, and so the lower the final pressure. Comparing the final pressures of the two cases tells us the sample’s volume; this volume is divided into the meteorite’s mass to determine its density. Helium, the gas with the tiniest molecules, will penetrate into the finest cracks and pores of the meteorite; this is good. It will also leak through the tiniest cracks in an experimental set-up; not so good. We could hear hissing from somewhere. Finally, pulling the pycnometer apart, we found a broken tube. Time to order a replacement from the manufacturer. Another month lost. The next week, Dan returned to New York with the tube, and fixed that leak. But all that’s accomplished is to show up smaller leaks we hadn’t noticed before. The regulator that controls the pressure from the helium tank to the pycnometer is clearly not helium-tight; time to replace it. The outlet fitting is a quarter-inch, while the connecting pipe fitting is metric; another fix needed. Each patch we apply only reveals another leak further down the line. We’ve lost a quarter of our helium so far, without getting a single measurement. And I had less than three months left in New York. These frustrations only remind me of my own spiritual state, this Lenten season. I’m not a terrible sinner; really, only one or two things need patching, right? But the only evidence I have that I’m making progress in my prayer life is my ability to constantly find faults that I hadn’t noticed before. I know I will never eliminate all the leaks in my helium plumbing. My only hope is to get to a point where it’s good enough, where I can actually get something accomplished, some data collected, some good done in this world. With the grace of God, maybe I’ll get to that point by Easter. It's an amazing morning; for the first time in about three weeks I don't have some deadline that has to be met by today, and I can actually catch my breath! Some Stats: But first, my monthly (a bit late this month!) summary of statistics. As of this writing we have 8,336 people signed up to get notifications of these posts either via Twitter, Facebook, or directly asking for email updates here. That's not quite a hundred more than last month, when we had 8242. And we're up to 120 subscribers, an addition of 4 new members. Thanks, and welcome! And what's new: So what is it that has kept me so busy? Travel to Kentucky and Ohio (including in Wapakoneta, the home of Neil Armstrong); the Tucson Festival of Books; and talks to a group of seminarians from Wisconsin and alumni from Yale. One more review article out the door; that makes about a book's worth of writing I have done in the last 8 months. If only I had saved that all for a book of my own. It hit 80 degrees in Tucson yesterday, but a week ago it was snowing. This is the view out my airplane window flying over southern Arizona en route to Kentucky. This column ran in The Tablet for the new year's issue of 2008, when Easter occurred remarkably early, on March 23. It was relatively early in 2016, on March 27th, when we ran it here. This year, it's about as late as it can be! Early or late, the explanation is the same... and so probably worth running again. This page from Fr. Christopher Clavius' 1603 book explaining the reform of the calendar lists his calculations moveable feasts during our epoch. Note the typo for 2014 -- Easter was late that year and so Ash Wednesday should actually have been 5.Mar not 5.Feb! Why is Ash Wednesday so late this year? Contrary to popular conception, the Vatican Observatory doesn’t set the date of Easter. (We don’t cast horoscopes for the Pope, or evangelize UFOs, either.) But since Pope Gregory’s reform of the calendar in 1582 marked the beginning of the Vatican’s support for astronomy, we have a historical connection. Our calendars have always been marked by a confusion of days, planets, and gods. Even today, our week begins with the Sun’s day, followed by the Moon’s day and ending with Saturn’s Day. The month (think, “moonth”) was originally based on the 29.5 day period of the Moon, while the year is fixed by the Sun’s apparent motion through the zodiac. If your culture is centered on animals — fishing, hunting, caring for flocks at night — moonlight and tides will control your life and your calendar will follow the Moon. If you grow crops, then seasons are more important, and a solar calendar makes more sense. The Jewish calendar, including such festivals as Passover, is lunar; the civil calendar of Rome, set by Julius Caesar, is solar. The Church’s calendar is a holy marriage of both. Thus, most saints' days are fixed into the yearly calendar, like Christmas; but Easter was set by the Council of Nicaea as the first Sunday after Passover. By medieval times, our astronomy had advanced to the point where it it should have been possible to calculate when those lunar holy days would occur. But in practice, such calculations turned out to be surprisingly difficult. Pope Gregory’s calendar committee, commissioned by the Council of Trent, settled on a simple and elegant solution first proposed by Aloysius Lillius. Instead of trying to determine with perfect accuracy the Moon’s position and the first day of spring, they devised a formula which closely, if not exactly, follows the “first Sunday after Passover” rubric. (In fact, they differ roughly 5% of the time.) The earliest that Easter can fall is March 22; this occurs roughly once every two centuries. A March 23 date, such as we had in 2008, is a once-a-century event; the next one is in 2160. Meanwhile, the latest Easter can occur is April 25, which will next happen in 2038; on that day, Ash Wednesday is on March 10. What’s more significant, however, is the underlying principle behind this arbitrary formula. The Sabbath was made for man, not man for the Sabbath: our religious feasts are not controlled by the Moon. And so future colonists on Mars or beyond can set Easter for whatever date best suits them. That may turn out to be a very useful principle, once it comes time to evangelize those UFOs! Reuters image of the Tohoku Pacific earthquake on 11 March 2011. I had wanted to follow up here on the results of the Hayabusa mission, which I have mentioned many times over the years in this column. This was the probe the Japanese Space Agency had sent to asteroid Itokawa, which touched the surface of that asteroid in late 2005. After overcoming a number of technical crises, including the failure of the system they’d devised to get chunks of rock into a sample canister, the probe actually succeeded in sending its sample return capsule to the Australia desert during the summer of 2010. Since the sampling system had failed, the most they could have hoped to recover were a few bits of dust inside the container. Their silence in the following months had led me to conclude that they had gotten nothing. But earlier this month, at the annual Lunar and Planetary Sciences meeting in Houston, scientists from the University of Tokyo presented wonderful results. With a special teflon spatula they had carefully scraped some 1500 flecks of dust, comparable in size to grains of flour, from the side of the canister. After getting them off the spatula (by tapping it with a screwdriver) they measured the chemical composition and physical state of these bits. The result: they are definitely pieces of the asteroid, not just debris from the spacecraft. They look exactly like a particular well-known variety of ordinary chondrite meteorite, designated as type LL6. This result is a tribute to the patience and skill of the Japanese scientists. It’s an important addition to our small inventory of samples that we’ve brought back from celestial bodies (the only others are the Moon rocks and dust from Comet Wild). It’s scientifically profound because it shows that asteroids and meteorites really are made out of the same stuff: not just similar, as I might have thought, but indistinguishable. Our collections of meteorites may indeed be a pretty reasonable sampling of the material that made up the planets. And even more delightful is that astronomers, looking at nothing more than the average infrared colors of asteroid Itokawa, had previously suggested that their best guess for its composition was exactly the type of meteorite that the dust grains turn out to be made of. It’s always reassuring -- though, truth be told, we’re always secretly surprised -- to find out that this stuff actually works. As I said, I wanted to write about this triumph of the Japanese Space Agency. But now, one cannot even say the name of that country without thinking of the massive earthquake hit the coast of Japan just a week after they presented these results. Of course, there’s no connection at all between the science done outside Tokyo and a tsunami that hit the eastern coast hundreds of kilometers to the north. But in our very human emotional reactions, the one evokes the other. In ancient times, calendars were numbered from events, like the accession of a king, that everyone could remember. In a similar way, today we connect places with some powerful (and usually unhappy image) in its history. “New Orleans” evokes hurricane Katrina, “Lockerbie” has come to mean an airplane terrorist attack. We can only look forward to the day when “Japan” means more than just the frightening sight of damaged nuclear plants. We reached two more asteroids in late 2018 with spacecraft that should bring back more samples. And while the memory of the Japanese tsunami has faded from the world's consciousness the aftermath is still felt in Japan. Across the Universe: Desert or a dessert? Apply Now for the 2019 Faith and Astronomy Workshop! Across the Universe: Heavenly peace? Happy Birthday to the Father of Astrophysics!